Two types of graphs can be used to represent wave motion. Crest: highest point of a wave. Trough: lowest point of a wave. Amplitude, A: maximum distance from the rest or central position, in either direction. 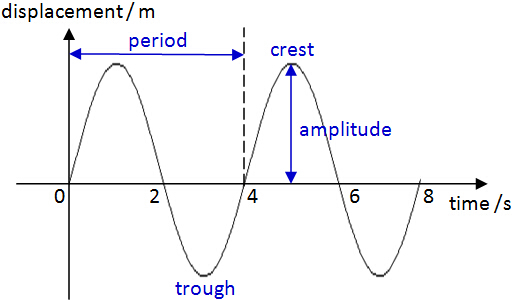 Wavelength, λ: shortest distance between two consecutive crests or troughs of a wave or any two points that are in phase. Phase: any two points are in phase when they move in the same direction with same speed and have same displacement from the rest or central position. i.e D and B are in phase, but not with C.
Period, T: time taken to form one complete wave. Frequency. f: number of complete waves produced per second. Formula: f = 1 / T.
Wave Speed, v: distance traveled by a wave per unit time. Speed of wave affected by the depth. Wavefront: an imaginary line joining all the crests or troughs in a wave. To determine the movement of a particle in transverse wave, we have to sketch another wave in the wave direction. For longitudinal wave, it is much more complicated and will be discussed in Sound. The diagram shows a traverse wave on a string with two points P and Q marked. The wave is moving in the direction shown. What will happen next to particle P and Q?